A fast efficient way to achieve a smooth dolly track shot. Designed for use with most camera dollies not exceeding 34" in width. Each truck consists of 8 wheels, 32 per set, staggered in position. 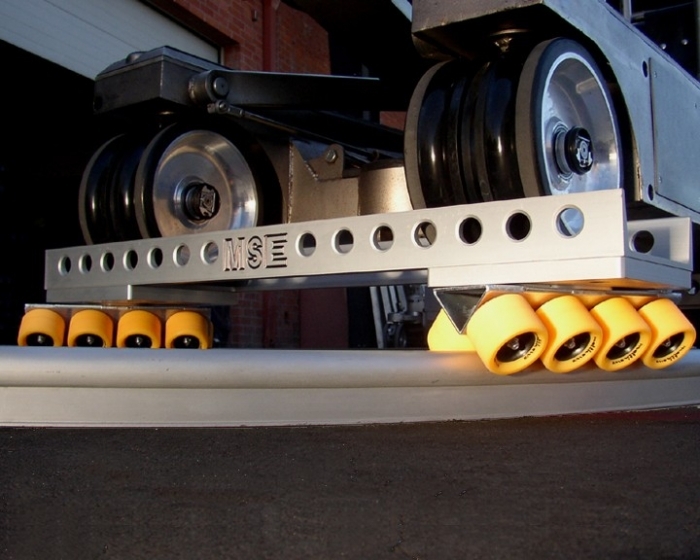 Wheels are engineered to perform on older, less than perfect track as well as the newer, precision track systems using 1-1/2" diameter rails. The Centipede's wheels will remain round under normal conditions. For maximum performance minimum weight load is 200 Lbs. Maximum load is 1500 Lbs. Dollies not exceeding 46" wheel base will work well with the 10' diameter curve track.